Soy bilingue ahora! (I´m bilingual now!) aquí pueden ver en vivo y directo el demo del tutorial (here you can see in live and direct the demo for the tutorial) solo presionen (just press) Load Game , Chaozz! Para hacer funcionar el NavMesh OverWorld Map System, se requieren 4 componentes principales: Un Main Camera (camera), un Overworld Map (map), los Overworld Goals (goals) y el NavMesh Path, y finalmente, el NavMesh Agent o Playable Character (character). Sólo estos componentes bastan para un sistema simple y útil! La Camera está acompañada por un “look at objective”, el cual servirá como el punto de atención para el Character. Es el punto al que siempre deberá ver, ubicado justo al centro entre el Map y la Camera. Una cámara simple y un gameobject en blanco. Los Goals estarán conformados del listado de objetivos a los cuales el Character deberá poder acceder durante el recorrido por el Path. Estos Goals serán el punto de acceso a niveles desbloqueados, tesoros ocultos, enemigos escondidos o lo que el juego demande. Se pueden colocar cuantos Goals se requieran, siempre teniendo cuidado de hacerlos consecutivos y que toquen en todo momento el Path. Tantos goals como niveles u objetivos se requieran. Además, el Path necesita estar conformado por un modelo realizado en algún programa externo. Como puede verse en la imagen, es una figura 3d, yo la creé usando Blender, pero bien puede realizarse en cualquier otro programa 3d (3DS Max, Maya, etc). Debe poseer un grosor justo para que el character pueda caber en cada recoveco y giro de esquina que posea. Se puede fácilmente sustituir el ejemplo que posee el Asset y colocar el propio camino personalizado. El path es una simple figura 3d sin mucho detalle. Para realizar el Map, sólo se requierá una imagen 2d, nada complejo, aunque también es posible que el mismo Path sirva como Map, añadiéndole un diseño para su aplicación en entornos 3d. En mi Asset, se emplea una imagen plana como fondo y se oculta la visualización (Mesh Renderer desactivado) del path, simplemente para simplificar el sistema. El mapa de fondo tiene la indicación del recorrido que sigue el character a lo largo del path. El Character se compone de los Sprites izquierdo y derecho que compondrán al personaje que se estará desplazando libremente por la pantalla, puede ser el diseño que se requiera. En mi caso, empleé un Sprite Renderer para usar una imagen 2d, pero así mismo puede usarse un modelo 3d, dependiendo de la complejidad que se maneje en el juego. Sólo dos imágenes bastan, puede usarse un sprite animado para mejor efecto, o un modelo 3d. Cuando se cambie el modelo para el Path, es importante notar que se requerirá volver a generar el NavMesh, el cual se realiza por medio del Window Navigation. Navigation está hasta el final del listado de windows. Una vez abierto, se necesitará seleccionar el GameObject con el modelo que se usará para hacer el Path, en este caso mi NavMesh Path. Se deberá establecer los parámetros del NavMesh Agent, como su Radius, Height, Slope, Step Height, todos ellos útiles para permitir una adecuada navegación del Character por el Path. Cuando se termine, bastará con oprimir el botón Bake, e instantáneamente se creará un área azul en todo el modelo del Path, debe cuidarse que el área azul sea completa y pase por cada rincón, si en algún momento corta y se descontinúa, será necesario reducir el Agent Radius o aumentar el grosor del modelo, de lo contrario, no se podrá crear el NavMesh Agent y no se completará la creación del NavMesh System. Es necesario considerar todas las propiedades para crear un path adecuado. EEste path ha quedado creado a la perfección. Por último, es necesario crear el NavMesh Agent, colocando en el GameObject seleccionado el componente debido. Se deben establecer los parámetros que se establecieron en el Path, o viceversa. El componente NavMesh Agent hará todo el trabajo pesado. Este mismo objeto poseerá los Scripts que vienen con el Asset Nav Mesh Move To y Eyes On Player, colocando en el lugar debido los GameObject que pertenecen ahí, en las casillas para Goal x se pondrá el goal seleccionado y si se requieren más o menos, se tendrá que modificar el Script para ello. En las casillas para Sprite Right y Left se pondrán los GameObjects que compongan el modelo del Character mirando hacia la dirección deseada, pudiendo hacer los cambios pertinentes que se requieran, como añadir más Characters, que sea modelo 3d, etc. Se personalizará los scripts proporcionados como mejor se prefiera. For the NavMesh OverWorld Map System to work, you need 4 main components: a Main Camera (camera), an Overworld Map (map), the Overworld Goals (goals) and NavMesh Path, and finally, the NavMesh Agent or Playable Character (character). The Camera it´s accompanied by a “look at objective”, which serves as the attention point for the Character. This is the point to where the character will always look at, centered between the Map and the Camera. The Goals are made of the various objectives to where the character will access traversing the path. This Goals will be the Access point to unlocked levels, hidden treasures and enemies or whatever you like. You can put as many Goals as you need, keeping them consecutive and always on touch with the path mesh. Moreover, the path needs to be made by a model realized in some other program, Blender, some Autodesk, etc. It has to possess an adequate width, enough so that the character can traverse every turn of the way. You can switch the one in the tutorial asset with whatever you like or make. To make the Map,you only need a 2D image, nothing too complicated, but it is posible the same model for the path serves as the map, just add a cute design for its application as a 3d enviroment. In the example asset, I used a simple 2D image, deactivating the Mesh Renderer component of the path gameobject, just for simplicity sake. The Character is made of the left and right Sprites, which will be the graphic being displayed as the carácter traverse the path, you can add whatever design you want. In my case, I used a Sprite Renderer because mine is a 2D image, but you can use a 3D model, it´s up to you. When you switch the model I provide for the path for your own, you need to take care of the regeneration of the NavMesh, which will be made through the Window Navigation. Finally, you need to créate the NavMesh Agent, just add to the selected GameObject the correct component. You will need to set the parameter you used for the path or viceversa. Goal x slot- The selected goal in that order, if you need more, just modify the script for that (instructions inside the script). Sprite right/ left- Just add the gameobjects that will comprise the character model, if you are using a 3d model, you may need to modify its facing direction with some other method than that I used here (if you need an example, tell me and I can upload another tutorial, it can even touch on mecanim if you need it). Target- you can put here the object that will keep the carácter facing the right direction. And that´s all! Just click Play and enjoy the game! You can read the instructions of use here and download the asset in the Itch.io portal of the author, also, there will be live Demos you can see in there. This Gameplay System consists of a Game Object with the capability of identify wheter the player hovers the mouse pointer over it, it reacts to clicks and an action will be prompted. The tutorial is special for those above no0b level in Unity 3D, those who know their way around the Unity interface, inspector and other basics aspects of it. To begin with the tutorial, it is necessary prepare a GameObject made with a Mesh model imported into Unity 3D (an .fbx from Autodesk, Blender, Solid Works, Inventor, Zbrush, etc.). In this case, I called it Clickeable Object, I put it in front of a camera so it could be visible for the player. In this demo I used a 2D camera system, but the object keep being 3D, the same with its environment and you can even use it with a 3D rotational camera. Floating over the Clickeable Object I put another Game Object called “Título” (“title”), made out of a 3D Text object, which possess a Text Mesh Component and displays a floating text in a 3D space without having to use a GUI Canvas. This text will serve as the title that displays the name of the Clickeable Object, it can be switched for an instruction, advice, icono, graphic or whatever you like and/or need. Next thing I put the content of the text that displays when you click over Clickeable Object. In this case I used a Unity 3D GUI Text, which requires for you to set an EventSystem and a Canvas on the scene. All the GUI objects that you may want to display In Game should be inside the Canvas, they can even be anchored by their limits to preserve the Aspect Ratio and the proportions even though the displaying screen change. It´s wonderful! This interface consists of a gameobject with a Viewport Component, which is inside a gameobject with Scroll Rect Component (Clickable Object GUI), which allows the player to scroll across the content from one side to the other (it doesn´t serve any major purpose here, just for fun and education!). In its contents there is the “cerrar” (“close) button (any normal button in Unity 3D GUI), plus a GUI text object with the content to show and a title (the same with the 3D text). Many uses of this system consists of NPC dialogues and names, interaction advices and more. A final component of this system is the object “Fondo” (“background”), which gives a better visualization of the content displayed with the mouse click, this with the intention of hiding the rest of the universo besides the text, controls, etc. Moreover, it prevents the player from accidentally clicking over other clickable objects in the scene. However, the same Viewport component can be modified to supply this same function, even adding customized images. You can opt to anchor the background image to the camera, so it will travel accompanying the player wherever it goes. 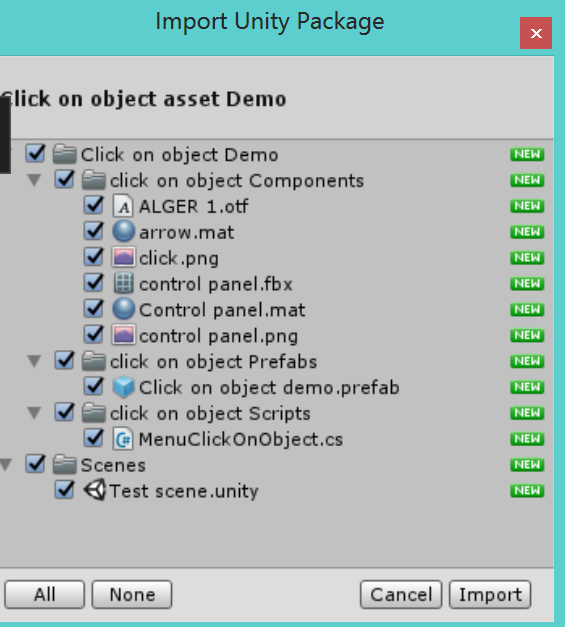 With all this objects ready in the scene, you can proceed to add the given C# script “Menu Click On Object” to the Game Object Clickable Object (you can consult how does it works inside of it, just open it with monodevelop). Aditionally, you could add a GUI element that indicates a given scene object is a Clickable Object, in this tutorial I used a simple signaling arrow with text, but you can implement whatever you like with better graphics! En esta ocasión les mostraré un tutorial para que sepan cómo usar los tutoriales que subo en esta página, en caso de que no sepan, si saben, ¡ignoren! Primero que nada, la mayoría de los tutoriales aquí tendrán demos que podrán ser probados en la misma página, pero a través del servicio de Itch.io, el primer tutorial tenía un demo de descarga por onedrive, para que cualquiera pudiera acceder a jugarlo aunque su proveedor de internet bloqueara Itch.io (en algunos lugares sucede, ¡qué miedo!). La carpeta del demo y el comprimido del asset. Tres archivos son necesarios para ver el demo, pero sólo uno se abrirá. Se abrirá empleando Mozilla Firefox, porque es cool y no requiere configuración para reproducir un elemento WebGL. El demo viene en un conveniente formato de Unity 3D llamado WebGL, que permite ser jugado directamente desde un navegador web, sin plugins o cosas raras adicionales, “el futuro, ahora” (osea, el presente pero más asombroso, ¿ok?). Si se posa el apuntador del mouse sobre el objeto al que apunta la flecha roja, se puede interactuar. Si se oprime el cuadrado de la esquina inferior derecha se abre en pantalla completa. Actualmente ya se cuenta con un Live Demo! Para abrir el Asset en Unity 3d y actualmente usarlo, necesitarás el archivo con el formato .unitypackage, pero para abrirlo, ocupas tener instalado Unity 3D en tu computadora, si necesitas un tutorial para eso… ¡pídelo! Pero como es algo tan básico y tan noob no saberlo, cobraré por hacerlo, o puedes buscar en cualquier lugar de internet, sólo escribe “¿cómo usar mi computadora?” (XD). ¡Ese archivo tiene todo un juego guardado en su interior! Sin especificar más, sólo ocupas abrir algo y probarlo, tú sabrás. ¡La imagen se explica sola! Uh, proyectos secretos... ¡nadie debe verlos aún! 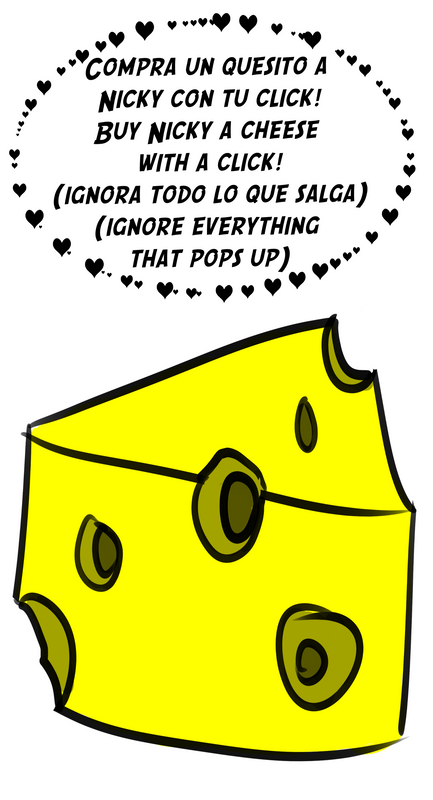 Todo es importante, ¡no olvidar! Esta sección está en una de tantas pestañas de Unity, donde te muestra los archivos que posee el proyecto y que puedes usar. Checa el tutorial, checa el tutorial! yeah, y si te gusta y quieres un asset, déjamelo pedido en comentarios! Para abrir el asset en Unity 3d y actualmente usarlo, necesitarás el archivo con el formato .unitypackage, pero para abrirlo, ocupas tener instalado Unity 3D en tu computadora, si necesitas un tutorial para eso… ¡pídelo! Pero como es algo tan básico y tan noob no saberlo, cobraré por hacerlo, o puedes buscar en cualquier lugar de internet, sólo escribe “cómo usar mi computadora?” (XD). Checa el tutorial, checa el tutorial, yeah, y si te gusta y quieres un asset, déjamelo pedido. Ojalá les haya ayudado, vatos, Chaozz!